Our Favorite Reads For April: "Ender's Game"
Christ Arose! Happy Easter Monday! Oh No! The Blue Screen Of Death! Abby's Walking Club Challenge--Woof! Woof! Did Anyone Else Watch "The Killing"? 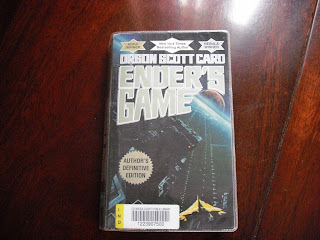 We both liked Ender's Game by Orson Scott Card and agree it is one of our favorite reads, not just for April but for the year so far! I know I'm way late to read Ender's Game by Orson Scott Card since it came out years ago. That being said, I thought this book was just AWESOME! For sure my book of the month for April and will rank very high in my books of the year list! The premise of this book is the government has tabbed Ender to be the next big commander. He is taken away from his family and sent to "Battle School." His brother, Peter, and his sister, Valentine, also play interesting roles in this book. If you loved Hunger Games and The Maze Runner series, you will love this book too! I liked Ender's Game very much too. I'm glad Gerard encouraged me to read it! Ender is just six years old when the government rejected his older brother and sister and took him instead to train to be the commander to fight against the buggers out in space and save the world. Ender is very smart and very endearing. He doesn't want to kill anyone but excels in the battle games. I liked how even though Ender was an "underdog" he was very clever and came out on top when others made things tough for him. The only thing I did not like about it was the ending. There's only one thing that will make them stop hating you. And that's being so good at what you do that they can't ignore you. I told them you were the best. Now you damn well better be. Taken from p. 35 of Ender's Game by Orson Scott Card. If you like stories about mind games, leadership, friendship, bullying, military strategy/training or science fiction, you would love this book! Anyone with battle experience I think would identify with Enger. We both highly recommend this one--it's awesome! No one even gave it less than 4 stars out of 2,835 customer reviews! That's saying a lot! I joined Gerard and Abby on their 4-mile plus "Sunoco" walk last Saturday and found out I could do it just fine, but then, it was a very nice day! Here's the link to Abby's 4-mile Spring Walk video I made of our walk that we plan to post here May 1 with Abby's Walking Club Challenge participants. I just discovered a Saturday Snapshot meme hosted by At Home With Books. I was able to install a free word processing program from www.openoffice.org but still can't open my other documents. Good thing I had the important ones backed up. It took an hour to install, but now I feel much better. Still don't have my picture editing Kodak software back though. I learned that boredom is a cause for stress in cats and there are many signs of stress--some I knew, some I didn't. Check out Stress Awareness In Cats to learn all about this at The Conscious Cat. Mrs. 4444 made my day when she left the following comment on our Friday Fragments post over at Grab A Book From Our Stack: Your header is my current favorite in Blogland--GORGEOUS! That made me feel good! Be sure to check it out. I posted a short "behind-the-scenes" video yesterday of how my cats help me with it. Her blog would be pet free, few pictures and probably humorous. I know she would have enjoyed reading blogs especially from other countries because she always liked books about foreign cultures. She would have loved the interaction with other bloggers just like I do, I’m sure. I think she would have been great at it and loved it. Since one of her dreams was to be an author and write a novel or soap opera, I bet she would use her blog to write a continuing story each day. It would have been fun to share this interest with her! I think her blog roll would include book blogs, inspirational blogs, family blogs and humor blogs. Perhaps a sports blog or two as well. I would like to see what her blog(s) would be like. Does your mom or dad blog? If so, please feel free to leave a link. What do you think your mom would blog about? Check out our book giveaway of "I'm Outnumbered--One Mom's Lessons In The Lively Art Of Raising boys" to a mom (or gift for a mom)--winner to be announced May 1 so you have it in time for Mother's Day. I am so glad I have place my hope in Jesus! I know he holds the future and I can trust him for all my needs and life is worth the living. So many people do not know Jesus as their personal Savior and those of us who do, need to share the good news and love and forgive others like Christ loves and forgives us! Hope you enjoy this last of the Easter hymns that I am sharing on this blog. Which was your favorite? I can't even just pick one! Thanks for those who took the time to view these! I hope I didn't lose too many readers by doing this. I love that I serve a risen Savior! Do you? I enjoy spending time talking to God in prayer each day and reading His Word. I hope you enjoyed these Easter hymns I shared with you to help us worship Jesus together through blogging! Just one more to go. Can you guess what it will be? Have you voted in our favorite Easter hymn poll at the top right yet? I told you there were a lot of good Easter hymns! This is one of the most fun ones to sing because it starts out so slow and serious and winds up so quick and fun! All these videos are the same song, but each has a special quality that makes them stand out. The first is a small choir that reminds me of my small church that I grew up in and attended for years. If you don't want to watch all of them, just skip to the last one--it's the cutest of all and will make you smile! This video is a sweet little girl singing it without any accompaniment for her aunt. I loved it! These three little boys are so cute and I can't help but share their enthusiasm. If you skipped watching the first two, please take time to view this one! I guarantee it will make you smile! Easter may be over, but the celebration of Christ's resurrection continues! This is Easter and I am so excited! We are doing our puppet presentation for the children at church today telling the Easter story and showing clips from the Jesus film along with the puppets. Easter is special for Christians everywhere but it is extra special for me because I was born again into the family of God on an Easter Sunday 50 years ago! 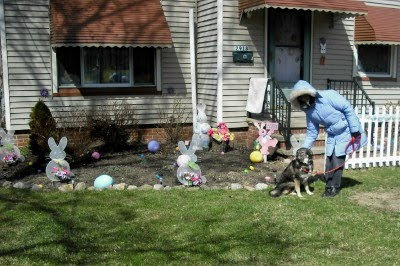 The best Easter decorated house Abby found in our neighborhood. Check out our book giveaway of "I'm Outnumbered--One Mom's Lessons In The Lively Art Of Raising boys" to a mom (or gift for a mom--winner to be announced May 1 so you have it in time for Mother's Day. We love it when our windows are open and we get some fresh air. We both took turns looking out on the first warm day of this year a couple weeks ago. 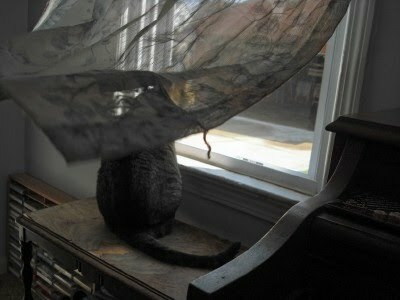 It was up to 80 degrees but very breezy as you can see by the curtain being blown off of us. Our flowers weren’t even in bloom yet but just starting to sprout out of the ground. The birdies were chirping though and that is what held our attention. 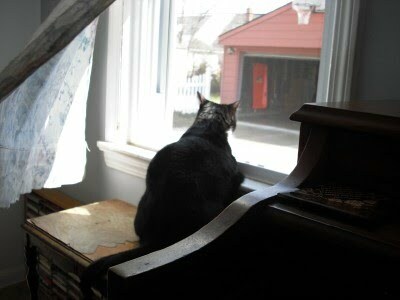 I wonder when the next time will be when we can open our windows--maybe today? Are your windows open yet? Hope you have gentle breezes and lots of birdies to watch! 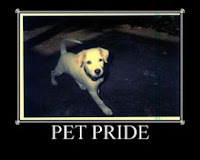 Find more pet posts at Bozo's Pet Pride linkup at Pets Forever. Over at Jodi's Journey this week I learned what happened to the dinosaurs. It's funny--go see The First Senior Moment In History. Now that my word processing program is gone after my computer hard drive had to be be wiped clean because of the "Blue Screen Of Death" I realize how important it is to save those software disks and operating disks. Okay, after reading The Hunger Games series, The Maze Runner, The Scorch Trials, and now this week Ender's Game, I learned that I do like science fiction after all! Each of these are teen fiction, but we love it! I picked this one for Good Friday because it is one of my favorites about what Jesus' death means for us. Have a good Friday! Have you voted in our favorite hymn pool at the top right yet? "At Calvary" is one of the easiest hymns to play so one of the first I learned on the piano. I hope you enjoy this one that I found on YouTube. Be sure to vote in our poll for your favorite Easter hymns in the right sidebar at top. First thing I said to Gerard on Friday morning, April 15, was “Happy Friday.” His response was, there’s nothing happy about it (because the Bruins lost their first playoff game at home). or its log or alternate. It is corrupt, absent or not writable. Contact your system administrator or technical support group for further assistance. This was not a good way to start my day, but after about 4 failed attempts, I gave up and joined Gerard and Abby on their morning walk, had a longer devotional time than usual, and played a little pool with Spunky to try to relax and get rid of my frustration. It really didn’t work, but Spunky was cute and made me smile! "The Old Rugged Cross" is probably the best known Easter hymn but is not my favorite. In fact, I really don't like this one much at all, but included it for those who do. Do you want to know why I don't like this one? Well, I'll tell you. It seems to me as thought it's the cross that is getting all the attention instead of Jesus, almost like idol worship. I'm sure that isn't the intent, but the cross is only a symbol and not one I cling too. I cling to Jesus! Did you vote in our favorite hymn poll yet at the top right? 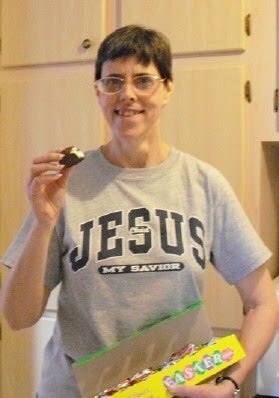 Our 5th and 6th grade Sunday School classes liked making resurrection buns last Sunday. They were easy, fun to make and tasted yummy! After washing their hands, each got one or two chunks of the frozen ready-made dough (Pillsbury brand Grands Biscuits) and made resurrection buns. Flatten dough out to 5" diameter circle. Wrap a marshmallow up in it and pinch close completely. Place on cookie sheet face down to help prevent them from opening. When done, the marshmallow disappeared just like Jesus' body disappeared from the tomb when he rose from the dead! The boys were surprised the marshmallow was gone! Have you voted in our favorite hymn poll at the top right sidebar? There are so many great Easter season songs that I love to sing and thought I would share them on this blog the whole week leading up to Easter and some even the following week to celebrate the greatest event in history ever--the death and resurrection of Jesus Christ my Savior and Lord! I may or may not post other things as well this week, but for sure I wanted to take time out from my regular blogging to praise God and just share some good old Easter hymns. I don't get to sing them in church very often because we generally just sing them on Easter or Good Friday. I hope you will join me in listening to these that I post each day to praise the Lord with me and make this Easter week special. I don't know that "And Can It Be" is really considered to be an Easter song or not, but it certainly has the message of Easter in it and expresses my awe better than any other I know. Hope you enjoy this video I found on YouTube. Have you voted in our favorite hymn poll yet at the top of our right sidebar? I like to do something new sometimes, don’t you? It’s fun to experience different things now and then. My big new adventure was going to my first “Meet The Author” program at the library to hear Shelley Shepard Gray, a full-time writer. I first learned about Shelley Shepard Gray from Christian Fiction Blog Alliance promoting one of her books, The Caregiver . I thought she sounded like a nice person I would like to know so was excited when I saw she was coming to speak at our library. I was curious to see what this would be like and invited Gerard to come too. He declined saying he would be bored; there were only three men there but about 50 women. Shelly was both humble and amusing as she shared about some of her characters in her books and her time with her Amish friends, questioning them while hoping she wouldn’t offend them. It wasn’t boring at all! She was very nice and even brought along two gift baskets for a door prize drawing. There was also light refreshments so I brought some cookies home for Gerard—always thinking of him. He put down the turf builder at home while I was at the library. I’ve only read three of her books so far: Hidden, Wanted. and Spring Renewal about an Amish school teacher. I am currently reading Forgiven, the third book in the Sisters of the Heart series. I also plan on attending more of these Library “Meet The Author” programs! It was quite interesting to me. Visit her website at http://www.shelleyshepardgray.com and to read about more of what she shared, read Meet Amish Romance Novelist Shelley Shepard Gray over at Grab A Book From Our Stack. Have you done anything new lately? Who would you like to meet? 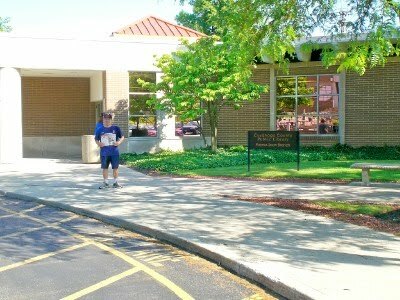 Do you attend any library events in your area? At Catyland's post, There's A Giant Cat Peeking Through My Wall, I learned about Canvas Prints. You can use a picture and get it enlarged onto a canvas to hang in your home. It looks really good! A plastic bag has been stuck in a tree for 3 years now. It's name is Windy and Kathy at The Junk Drawer celebrates it's birthday at work! This is just hilarious! Hope you will take the time to go see it's party and let us know what you think--is Kathy funny or just plain crazy? I am excited to see Ann at Up North join us in donating to charity per comment. The charity she chose is Heifer International, one I never heard of. Here is a video that explains all about it how they give livestock to help communities become self sufficient! Looks like a great charity! Why not visit her blog now and leave a comment. 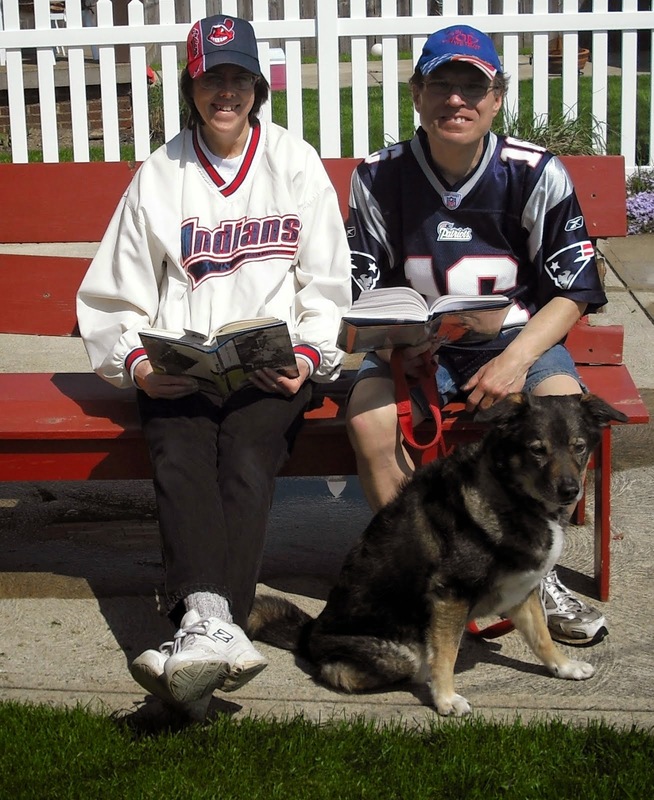 Gerard and I are featured book bloggers over at The Gatekeepers Post! For more Fragments visit Half-Past Kissin' Time. Ever Wanted To Try Something But Afraid Of Looking Foolish? I used to love playing catch in the backyard with my brother. We would take turns pitching and catching, pretending we were part of a game and sometimes threw the ball over the pitcher’s head for a hit. It was fun! As a kid I would have loved to try one of those speed machines that measure how fast you throw, but don’t remember ever seeing one then. I am always tempted to give it a try now though when I see one, but there are always people around. I’m afraid of looking foolish and only throwing about 30 mph, if that. Last summer there was one at the Science Center but several boys were around it so I just watched for a bit and moved along with Gerard. 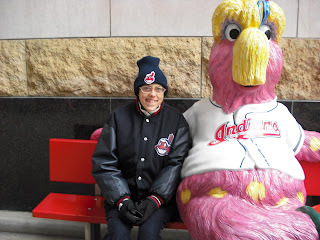 When we went to the Indians-Red Sox game last week, I passed up another opportunity. Again, too many boys doing it. One of these days though, I’m going to do it! What about you? Is there something you would like to try but haven’t yet? If so, why not? We are the Troll Family! 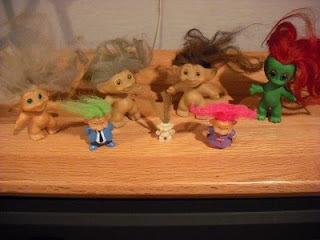 This is my little troll family but I am missing two of the little brothers: Blackie and Greenie and their little pet gray mouse with red whiskers. They were the same size as the little one in the middle with the straight orange hair. They must have been kidnapped! The tall green one with the red hair was the mother, the black haired one the father (because my dad had black hair), the two teen boys: the bushy white haired one and the long thin green haired one. Shows how naive and innocent I was. I don't recall what the big attraction was, but I liked the different colored hair that you could play around with and pet. The two little ones with the clothes in front were the grandparents! Sara: I had forgotten about them until my friend, Barbara, reminded me. I had them with all different color hair. Wish I knew where they were now. I used to like to braid their hair. Love the idea of them on a pencil. Lori: Funny I was just thinking back to those dolls the other day. They were weird little naked things but every one wanted one. Sara: They were definitely fun. Karen: I still have my trolls! Sara: Karen, share them on your FB page or your blog so I can see them please! Karen: Okay, I'll do a post about them soon. Thanks for the idea. What childhood toys do you still have? I have quite a few! I always thought I would save them for when I had children but that never happened. Fun Day At The Ballpark In April Gives Me High Hopes! It sure doesn’t feel like baseball weather and I was glad I didn’t have to play, I got two free tickets from work and we both took off last Thursday for the Indians-Red Sox noon game. Although the sky was gray the entire day, at least it didn’t rain. Temperatures did not get up as high as was originally predicted so we wore layers for the 37-38 degrees. It was great that we had the Club seats where we could sit in the lounge area to warm up and eat as much as we wanted for free since the cost of food was included in the ticket price. After eating lunch, we checked out our seats which were along the first base line close to home plate. I really think these are the best seats in the park! I couldn’t believe the guys in front of us were drinking cold beer and a few more rows away were a couple of girls eating ice cream! We drank hot chocolate which helped warm us up! In addition, we also got $5 to spend at a concession stand or souvenir stand so during the game we walked around and found some bakery. I got a delicious fudge brownie and Gerard got four big cookies. We were both pleased with our hunt! Upon return to our seats, we saw that another couple were sitting in them. There were a lot of empty seats and we easily could have sat somewhere else, but I preferred to stand. I could move around more to try to stay warm. 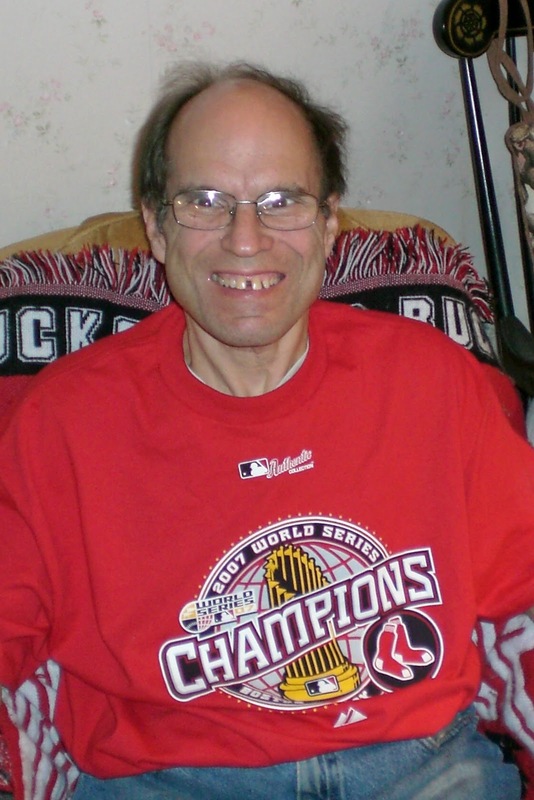 Gerard was very disappointed the Red Sox not only lost, but are now 0-6 to start the season! I was ecstatic that the Indians swept Boston! It was very exciting to see the tribe sweep Boston in their first home stand of the season. The game was a pitcher’s dual with a couple threats to score on both sides until the 8th inning when the Indians finally scored a run on a suicide squeeze bunt! The Indians looked good—Carmona pitched great and there were no errors! I was very impressed with Cabrera at second. Gerard took a picture of me and the Slider statue on the way out. Maybe we’ll do this again next month when Boston returns for another noon game—maybe it will actually be baseball weather by then too and I will have ice cream instead of hot chocolate! On our way to the bus stop, Gerard even said, “I guess I could be an Indians fan this year!” Wahoo! Check out Abby's Walking Club Challenge--have until the end of April to enter! Gerard said I should post this challenge to all my dog friends. I enjoy going on long walks and am sure others out there do too. So, the challenge is that if you get your human to walk with you over four miles round trip in one walk like we do, I'd like you to email a picture of you (or your human can be in it too) and I will make a collection and see how many we can get by May 1. Send your pictures to spunkydoodle [at] sbcglobal [dot] net with "Abby's Challenge" in the subject line and a link to your blog if you have one. Now get that human of yours moving! Woof! Woof! Also, leave me a comment here to let me know you are accepting this challenge or any other comment you may have. 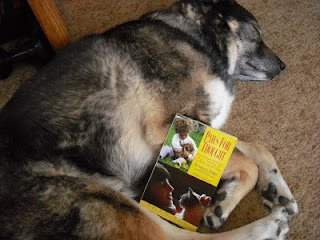 We will choose one of the entries by a random draw to receive Paws For Thought--How Animals Enrich Our Lives--And How We Can Better Care For Them by Anna C. Briggs. The winner will be notified by email as well as on the blog post. 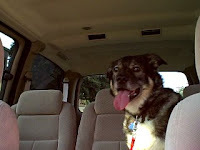 Check out more pet posts from my friends over at Bozo's Pet Pride or link yours up too! I am so encouraged to see another blogger, Beth Ann at It's Just Life, start donating to charity for comments left on her blog too! 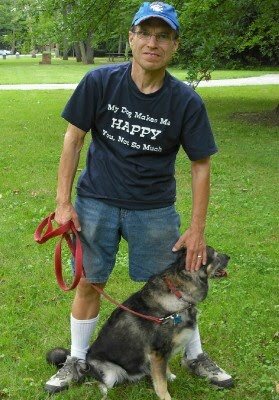 This month being Parkinson's Awareness month, she will be donating 50 cents to The National Parkinson’s Foundation for each legitimate comment on her blog. I am starting a blog roll in my right sidebar for blogs I discover that are doing this. Wouldn't it be great if more would join in? I you decide to do this, please let me know! I'd love to add your blog to the list and comment regularly. Over at Everyday Adventurer I learned that that crows are now believed by many scientists to possibly be the second most intelligent creatures on the planet? They're only behind humans. That's right. Not even chimps or dolphins are as intelligent as these birds. Ratty even got a great picture of a crow flying which is hard to do! 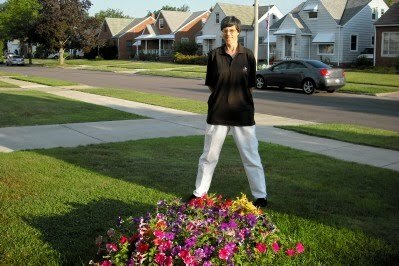 My mom told me that it’s not proper to wear white pants before Memorial Day or after Labor Day. Huh? To me this is just goofy and I think it may even be an obsolete rule these days, I’m not really sure. I do know though that if it’s a warm day and I want to wear white pants, I will! Oh, what a rebel I am! I like wearing white pants very much because any shirt, blouse, sweater or jacket goes well with them and looks sharp as opposed to my purple pants. There just is not a whole lot of colors that you can wear with purple! I’m one who follows the rules and so if this isn’t really a rule anymore, then too bad. It’s the only rule I can think of that I break. Do you follow this rule? What rule did you break? We'd like you to stop by our Wife v. Husband Bedmaking post if you haven't yet to let us know how you make the bed. On Sunday night on AMC they premiered a new series called "The Killing," showing two episodes back to back. I thought it was soooo GOOD! The premise is a teenage girl is found in a locked car on the bottom of the lake. She was still alive when she went into the lake. The car is one of many belonging to a councilman who is running for Mayor. The lead detective, a woman, is just fantastic in her role! Her co-detective is good too! There is a lot of suspense. I found it gripping! If you get a chance, watch it! Karen was on the computer so didn't watch it, but I kept telling her good it was so maybe she'll watch it with me next week. What did you think of this? What shows do you like to watch? We are taping this series on Sundays, 10 p.m. Eastern time, on AMC. 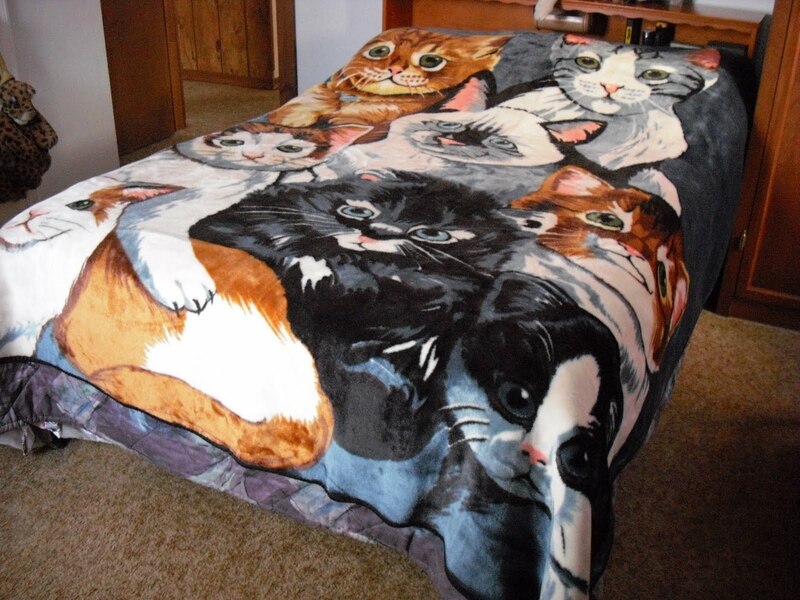 Okay, does this bed look made to you? 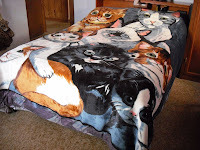 I think it’s made, but Gerard laughs and says I’m funny because I don't really make the bed. I think I do it as quickly and easily as possible by just straightening what is crooked and flattening out the crumpled things. Does it look good to you? It looks fine to me and it took less than a minute! Yup, all there. But my wonderful husband says to do it properly, I should take everything off first and then put it all back on. This seems very unnecessary to me and takes three times as long as you can see from the video below. Even then, I have to adjust it to get the sides even or practically do it over because when he does it, he sometimes gets the bedspread on the wrong way and I have to redo it anyway—and then, I have to do it his long way! I make the bed Monday through Friday and he sometimes does in on the weekend. Usually, I just make it as I walk around it on my way to the bathroom and then on my way to my closet. You see, every minutes counts for me because once my chores are done and I'm already for work, my extra minutes are spent on the computer before I leave and I want as much computer time as possible to visit and comment on blogs, do my link ups and maybe even a quick post. Gerard tells me most people do it his way. Since he was right about cleaning the trash can, he thinks he’ll be right about this too. So, how do you make the bed—my way or Gerard’s way? Please let us know in a comment. 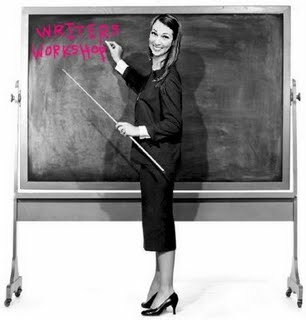 This is an old post I linked up to Mama Kat's Writers Workshop today that answers the prompt: Share a disagreement you're having with someone and let your readers be the judge. Head over to Saturday Samplings to find other outstanding posts from this week. Our Favorite Reads For March: "A Rope & A Prayer" and "Vicious Cycle"
Between us, we read 22 books in March so choosing just one each as our favorite is very difficult. We encourage you that if you enjoy reading, you visit our book blog: Grab A Book From Our Stack to see reviews of all the books we read. (1) It is the true story of David being kidnapped and held for over six months! (2) It’s the story as told by Kristen, newly married, sharing her feelings as her husband was being held. (3) It gives really wonderful insight into the Taliban and what they think and believe. (4) The writing is so very good that I got the sense of what David and Kristen went through. (5) Has a great ending too! I was hooked from beginning to end! It is actually about two families, one Christian family with a teenage daughter (Emily) who is just getting out of rehab after being in for a year and the other who is addicted to meth and wants to sell the teenage daughter’s baby for $45,000. The only glitch is that the girl, Jordan, does not want to sell her baby but wants to give it up for adoption instead, and gets Emily’s brother (Lance) to help her get it away from her mother and brother. Thanks to everyone who commented on our blogs during March! We donated $159 to Canine Lifeline which really is our first donation ever to that organization. Our dog, Abby, is very pleased about this! I was surprised to learn from our poll that most people (20 out of 29) do check back to view comments in a day or two after they leave one. I generally don't but did a couple times this week. I usually leave my email when making comments, but not always. If I'm in a hurry, I'll sometimes just use the Google thing which does not show my email then. I guess it is worthwhile to respond to comments with a comment on the blog then so I will continue this practice. I always respond by email if I have the email address. We are pleased to say that we got 500 comments during March (No, we didn't, April Fool!) but seriously, we did get 317 so will donate $159 to Canine Lifeline. For April, we will donate 50 cents per comment to Samaritan's Purse to be used to send supplies and relief to Japan to help with the recovery from the earthquake and Tsunami. I'd LOVE to go to work with Gerard! When playing the Free Kibble Trivia, I learned that 1 in 5 U.S. companies let employees bring their dogs to work and studies show that the humans are happier and more productive!! We can't bring Abby to work with us; can you bring your dog to work? This is a statistic that I definitely question. I also learned that the Detroit Tigers have a cat mascot! I like that!! Now I like that team more! So glad baseball season has started again--now that is the final sign that spring is here! 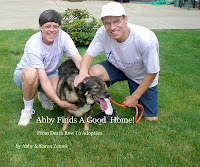 Check out the pet adoption story contest over at Freekibble. The winning story will be published April 8. Over at April Showers Blog Design I learned that there are 5 new views we can choose from for viewing Blogger blogs. Check out her post: Cool New Ways To Read Blog Posts. I don't think I like any of them. Have you tried using any of these new views? What do you think of them? Click this link to find more Friday Fragments or link up your own!